Today, Google announced that one of my KML visualisations won a prize in the KML in Research contest. 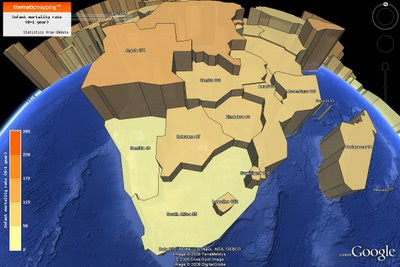 The animated prism map shows Global Infant Mortality from 1960 to 2005. The statistical data was downloaded from UNdata, a great resource for global statistics. The statistics can be explored in time and space. Click here to download the KMZ file. My dissertation, Using KML for Thematic Mapping, was also awarded the MSc Dissertation Prize at University of Edinburgh. The second part of my dissertation gives a detailed description of the Thematic Mapping Engine, and can be downloaded from thematicmapping.org. Congratulations on both counts. Your innovative work in this area certainly deserves recognition. Congratulations Bjørn! Hope to see you back in the States soon. Congratulations for your impressive work! Except this blog, your other web pages are in "time out"? When will this situation be recovered? great news! Congratulations for nice work.